Rece ntly, McAdams partnered with NC State Engineering and other local firms as a presenting sponsor for the “Dream Big” film being shown in the IMAX theater at Marbles Kids Museum. Through this relationship we participated in a “Dream Big Engineer It” event held at Marbles, where several engineering firms and organizations provided hands-on activities in which kids explored different areas of engineering. The purpose of the overall “Dream Big” event was to build knowledge about engineering, expose kids to engineering-related careers, and offer parents suggestions for engaging in engineering exploration at home. 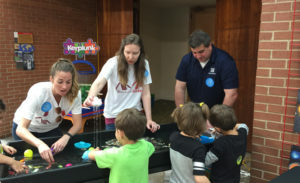 McAdams hosted a stream table demonstration which allowed kids to explore how the flow of water is affected by rocks, soils, and other objects – Offering a scaled-down version of real-world stormwater management and erosion control measures. The kids really enjoyed building dams and soil mounds and watching them wash away downstream (what kid doesn’t love playing with mud?). The event was a blast, and we know everyone (kids, parents, and volunteers!) left feeling empowered to discover the engineering all around them and to DREAM BIG!